On the heels of the Baltimore Orioles’ announcement about the team’s $81-million economic impact on Sarasota County, the baseball club has earned plaudits and a Top 10 ranking for its Spring Training facilities. David Rovine, vice president for the Orioles in Sarasota, sent an email on Feb. 25 to Virginia Haley, president of Visit Sarasota County (VSC), and County Administrator Tom Harmer, pointing out that Ed Smith Stadium was No. 5 on the list of Spring Training destinations reported by Anthony Castrovince on the Sports on Earth website. The Orioles began their seventh season at Ed Smith Stadium in Sarasota on March 2. The team will play 16 home Spring Training games this year. McKechnie Field, the Pittsburgh Pirates’ Spring Training facility in Bradenton, is No. 9 on the list. JetBlue Park in Fort Myers, where the Red Sox train, is No. 6. No. 1 is Salt River Fields at Talking Stick in Scottsdale, AZ, which is located on Native American land, the list says. The Diamondbacks and Rockies both play there. No. 2 is Bright House Field in Clearwater, Spring Training home of the Phillies. The Sports on Earth website says it features a team of sportswriters on the NFL, college football, MLB, NBA, college basketball, golf, tennis, hockey and more. The Top 10 list of Spring Training fields may be found here. 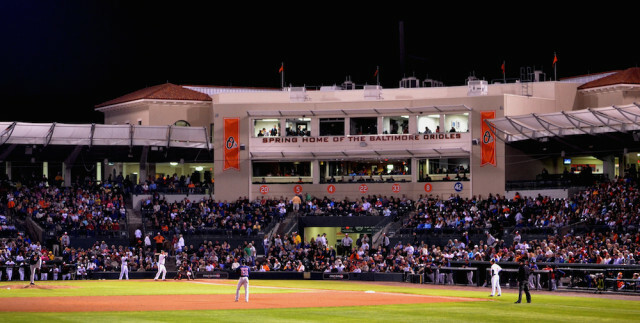 The release points out, “Now in the seventh year of a 30-year partnership in Sarasota, the Orioles’ economic results were bolstered by the club’s continuous promotional support of Sarasota tourism, as well as by record attendance at Spring Training games in 2015.” Last year, the team set a franchise record in average attendance per game, the release adds, drawing more than 110,000 fans over 15 home games. 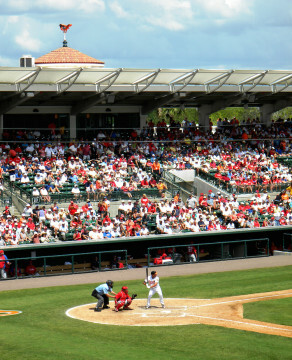 Ed Smith Stadium operated at 99-percent capacity throughout Spring Training, with a record-breaking average of 7,484 attendees per game, the release says. “Since the partnership began in 2010, more than 640,000 fans have enjoyed Orioles Spring Training games at Ed Smith Stadium. Additionally, each year more than 25,000 participants and spectators visit the Orioles facilities year-round for baseball clinics, youth sports leagues, tournaments, and other family-friendly and charitable events,” the release continues. 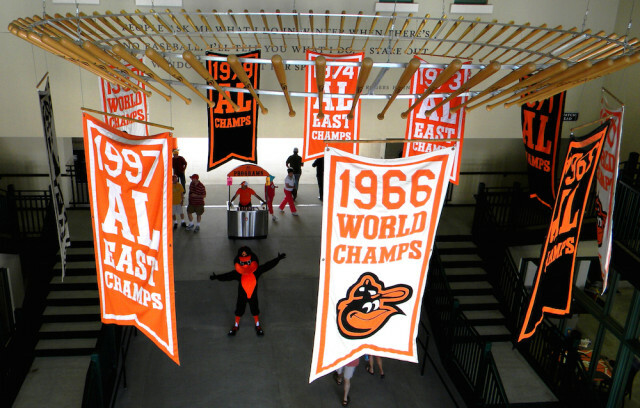 The year-round, multi-platform marketing partnership between Visit Sarasota County and the Orioles “allows the team to use powerful multimedia assets to promote Sarasota to Orioles fans in the club’s seven-state Mid-Atlantic region,” the release points out. “The partnership includes 360-degree exposure on the team’s television, radio, and digital platforms, as well as in print publications, advertisements, and at special events. In 2015, a Visit Sarasota County analysis found that a record number of tourists visiting from the Baltimore/Washington, D.C. area “catapulted the Mid-Atlantic region to the top of the charts for Sarasota’s origin-of-visitor cities — a rank held for several years by New York City,” the release says. “In the spring of 2015, nearly 26,000 visitors from the Mid-Atlantic region came to Sarasota County, representing an increase of 128 percent over the same period in 2014, according to the VSC report,” the release continues. For more information on the Orioles’ year-round activities at Ed Smith Stadium and the Buck O’Neil Baseball Complex, visit www.orioles.com/sarasota.